❝ Perry and Murray shook hands, hugged and agreed to get it done. Then they kept everything that happened that day a secret. If this raises a few flags for you, then you understand the predicament I was in when I was still employed at DOE in March 2017. I thought about it and decided to release the photos and the story to the public, after which I was placed on leave and then fired. My personal laptop was seized (though it was recently returned to me), and I was subjected to intimidation tactics from DOE staff. ❝ Some of the policies Murray’s company has advocated for have been faithfully executed without research, thoughtful public comment periods or policy input from public health professionals. President Trump pulled out of the Paris Agreement on climate that cuts down on greenhouse gas emissions globally, and his administration gave notice of repealing the landmark Clean Power Plan, which reduced greenhouse gas emissions from coal plants nationwide. The Trump administration attempted to delay, but was eventually forced to proceed due to lawsuits, clean air protections against smog pollution. The President also nominated a coal company consultant to oversee national mine safety and began cutting EPA scientists and other career agency staffers in droves. Who expects different from Trump – or the Republicans in charge of Congress? Coal, nuclear plant operator files for bankruptcy, asks Trump for a bailout : FirstEnergy’s request comes after regulator struck down an industry-wide bailout plan. https://arstechnica.com/tech-policy/2018/04/coal-nuclear-plant-operator-files-for-bankruptcy-asks-trump-for-a-bailout/ If the DOE were to issue an emergency order in favor of FirstEnergy, PJM would have to negotiate with each plant to acquire and resell its power. The Wall Street Journal notes that this would save jobs throughout FirstEnergy plants, but it would also likely lead to higher electricity bills for customers throughout the region. The WSJ also notes that one of FirstEnergy’s biggest coal suppliers is Murray Energy, whose CEO has donated significantly to Trump’s political groups. 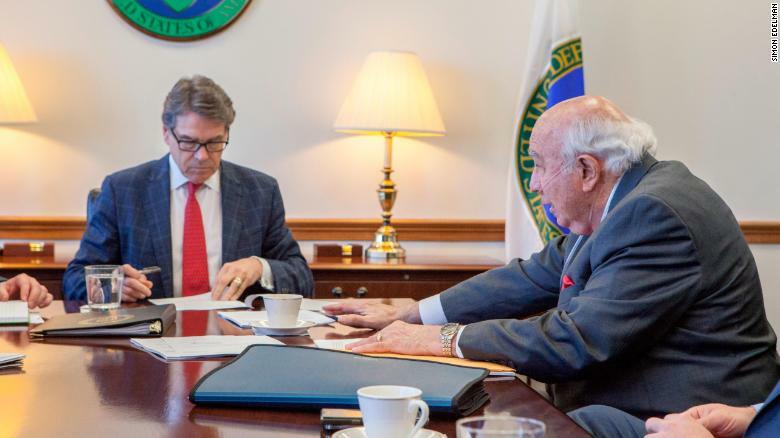 Murray Energy reportedly made a similar request for emergency action from the DOE last year, although that request was denied. “…According to Bloomberg, the memo added that these coal and nuclear plants are being replaced by natural gas and renewable power generation that is not secure or resilient. Environmental Protection Agency chief Scott Pruitt luxuriated in a coal baron’s pricey ringside basketball seats last year as he and President Donald Trump have sought to dismantle a system of environmental regulations that coal companies oppose, The New York Times reported. https://www.nytimes.com/2018/06/02/us/scott-pruitt-coal-joseph-craft.html The coal billionaire visited Pruitt at least seven times during the EPA chief’s first 14 months in office, more than Pruitt met with any representative of an environmental organization, according to the Times. In October, Mr. Pruitt traveled to Mr. Craft’s childhood hometown, Hazard, Ky., where, with Mr. Craft in the audience, he announced the repeal of the Clean Power Plan, an Obama-era policy to curb greenhouse gas emissions from power plants. A month earlier, Mr. Pruitt postponed enforcement of a rule barring coal-powered plants from dumping toxic metals into rivers, a move requested by a coal industry group with Mr. Craft on its board. “It Appears That The Worst Kind Of Black Lung Disease In Coal Miners Is On The Rise” http://allthatsinteresting.com/black-lung-disease-increase Progressive Massive Fibrosis (PMF), is the most debilitating and deadly form of black lung disease. Reasons for this resurgence are unclear. But it could have something to do with miners working longer hours and more days per week. The affected miners also tend to work in smaller operations, which may invest less in dust reduction systems. The study found that most miners with PMF worked in mines in West Virginia, Kentucky, Pennsylvania, and Virginia. “Jobs Alliance,” Funded by Trump Backer, Tries to Block Gas Plants That Would Bring Jobs to West Virginia” (Charleston Gazette-Mail Sept. 28, 2018) https://www.propublica.org/article/jobs-alliance-tries-to-block-gas-plants “Murray Energy, one of the nation’s largest coal producers, is paying for lawyers trying to block natural gas plants that would support a growing industry. Murray Energy’s founder and CEO is Robert E. Murray, who is among the nation’s best-known advocates for reviving the coal industry and cutting regulations related to it. A group backed by Murray Energy has tried to block gas plants in West Virginia. The state Supreme Court rejected arguments against one plant, saying it will help the local economy. (ProPublica/The Charleston Gazette-Mail Nov. 2) https://www.propublica.org/article/jobs-alliance-backed-by-murray-energy-loses-bid-to-stop-west-virginia-natural-gas-plant “…Separately, the jobs alliance appears to have abandoned challenges of gas plant permits issued to the Brooke County Power plant and another in Harrison County. The group’s lawyers did not file appeals of permit approvals prior to the legal deadline for doing so, developers and supporters of the plants said this week. “Trump to nominate former coal lobbyist Andrew Wheeler as next EPA administrator” https://thehill.com/policy/energy-environment/417159-trump-to-nominate-acting-epa-chief-wheeler-for-senate-confirmation “Wheeler became acting administrator in July, when then-EPA chief Scott Pruitt resigned amid numerous spending and ethics scandals. Wheeler at the time was the EPA’s deputy administrator, a Senate-confirmed position he assumed in April.